I am entering in the One Layer Simplicity challenge. I hope you follow the link to check it out because Ardyth, a stamper I admire, is hosting the challenge this month. I am also entering in the second NBUS Challenge hosted by the talented Darnell. I started with Soft Sky ink on a (NBUS) Hampton Art Stamp with squares. I have had that stamp for ages and never found a use for it until now. Two colors of Distress inks went over the corners and then the squares were stamped on the card. 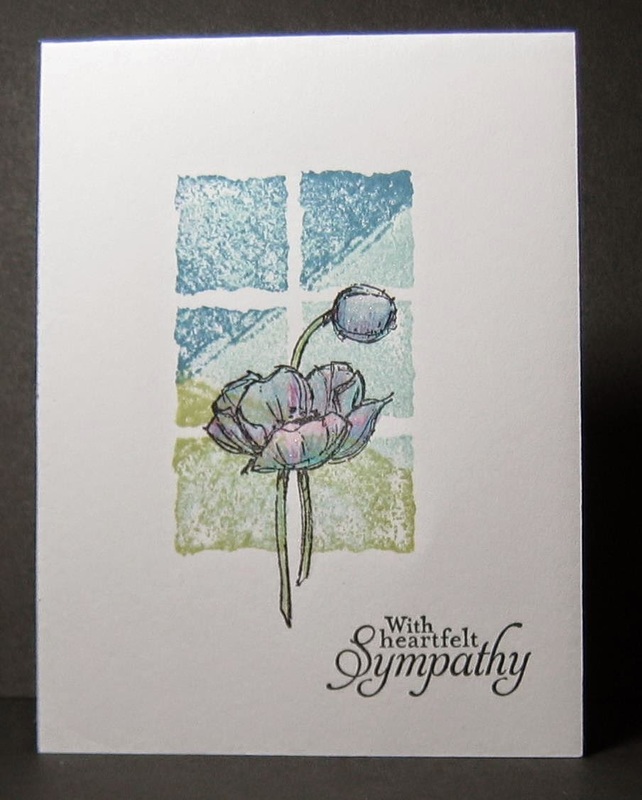 The flower and greeting came from Stampin Up's Simply Sketched; the flower was colored with pencils. The only embellishment is Wink of Stella over the flower which doesn't photograph well. PS: We had to bring the second card home to finish - lots of coloring. So happy to hear when others get together to craft!!! Love this card!!! Great softness, texture and colors!! I adore Ardyth as well, she is a real gem, so sweet to hear such nice things about her!! Have a wonderful weekend!! This is so original. Love how you inked the squares at an angle. Lovely card. What a great night you must have creating cards with your friends. TFS.